the prospect of crafting a “stem cell baby” as teased in the trailer. Okay, so maybe that’s more an onomatopoeia than a word. 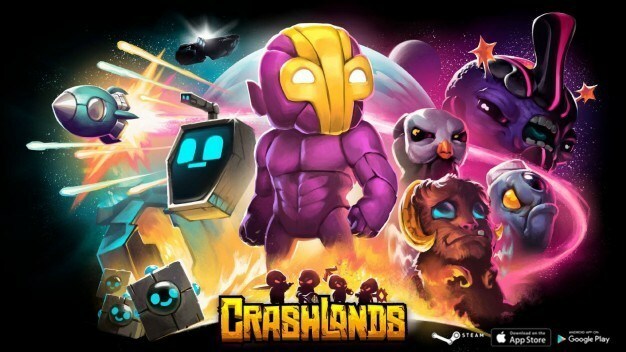 But that’s the sound that goes off in my head after playing Crashlands, which in turn begs the question: what’s wrong with Crashlands? The graphics are cute. The dialogue is witty—maybe overly so—and filled with innuendos. And it has the mass appeal of Minecraft mixed with a RPG. 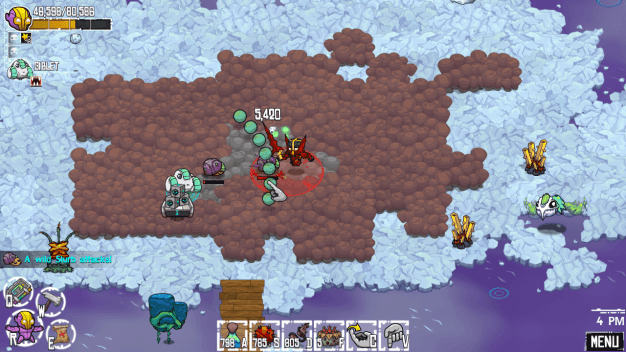 Yet, all that good stuff still didn’t save Crashlands from being clunky and repetitive. I should preface this post by saying I haven’t played Minecraft, but I now have a feeling building games (with an underlying story or without) just aren’t for me. It may be better geared toward a younger audience. Or, even more likely, it may be a mobile game adapted for the desktop, and key gameplay elements were lost in translation. Whatever the reason may be, I found myself bored (and rather annoyed) while playing. But that doesn’t mean it’s not for you! The game starts with a discrete tutorial that could have been more in your face, as I found learning the mechanics of the game quite time consuming. It’s all controlled with your mouse, though there are some quick access keyboard controls to open things like your inventory, map and quests screen. Expecting to have access to the standard PC arrow controls (up, down, left and right), this made for an extremely frustrating experience learning how to navigate. At first I managed by pointing and clicking, waiting for the character to move, and then pointing and clicking again. Lather. Rinse. Repeat. Eventually I learned you could hold down the cursor and guide your character, but this still makes for a clunky movement. The main premise of the game is to wander this planet you’ve crash landed on (clever, eh? ), building your own little world while fending off (or taming) the land’s creatures. 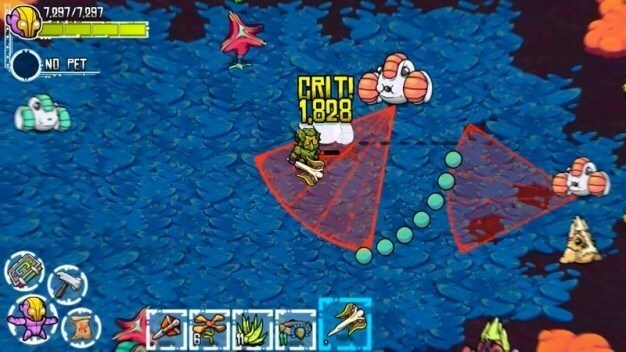 To build, you need to collect supplies, and you find find those by destroying your environment, or harvesting from the creatures you run into (read: you have to kill them, regardless how adorable they are). This requires a lot of pointing and clicking, and as such, I didn’t feel like I needed to think while playing. With my brain on the proverbial shelf, not only did my skull feel empty, but so did the game. That’s not to say there isn’t a storyline to Crashlands but that the skill required to progress was seriously lacking and evidently unnecessary. The crafting process proved to be easy to use, and quick… at first. 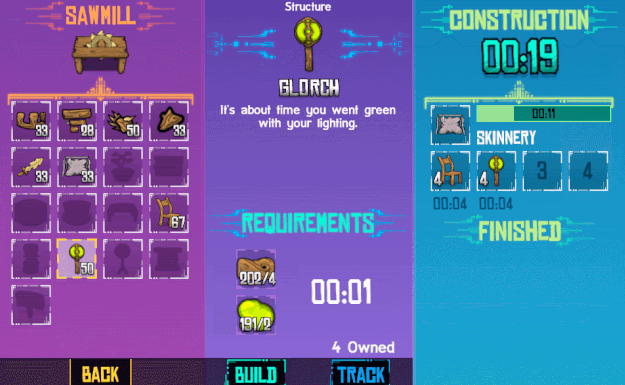 There are some recipes that, like most mobile games, require you wait a set time before the object is crafted. You can still play the game while this is happening, you just won’t have immediate use of that item. The beginning starts off with a lot of walking and a lot of collecting, until you create a few weapons and can speed up the collection process. But then it’s a lot of waiting for the object to be crafted. Catch 22, huh? 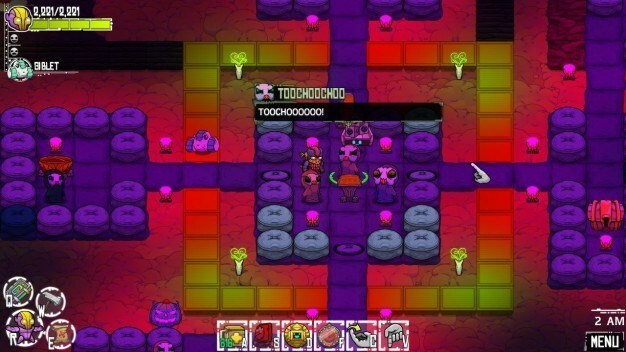 There are some shining notes for Crashlands despite how my review might come across. The cross-platform capability, where you can take your game from the PC to your mobile phone is quite nice. It offers more opportunities to play the game, which you can tell the developers really poured their heart and soul into — that’s evident, and admirable, even if I didn’t connect with the story itself. So, I’ll leave you with what I like to say about all critiqued art forms: try it out for yourself. I’m just one person, after all!